Below you can view all the homes for sale in the Willow Tree subdivision located in Las Vegas Nevada. 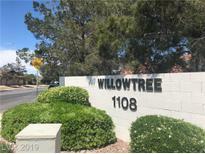 Listings in Willow Tree are updated daily from data we receive from the Las Vegas multiple listing service. To learn more about any of these homes or to receive custom notifications when a new property is listed for sale in Willow Tree, give us a call at 702-930-8014. Washer, Dryer & sink in laundry room with cabinets. MLS#2086136. RE/MAX Excellence. This Community Has No Rental Restrictions!!! Great Investment Property! !. MLS#2082512. Vegas Properties LLC. Entertainers dream backyard, with pool, spa, built-in BBQ, and covered patio. MLS#2082651. Keller Williams Realty Las Vegas. Immaculate,Highly Desirable Single Story Home In The Heart Of Summerlin*this 3 Bed/1 3/4 Bath Home Features A Vaulted Formal Living/Dining Rm&well Appointed Kitchen W/Custom Countertops Opening To Breakfast Nook & Open Concept Family Room*huge Master W/Walk-in Closet&shutters*this Home Has Been Totally Renovated W/New Tile, Int&ext Paint, Baseboards,Bathrooms,Countertops,Ss Appliances,Lighting Fixtures,Ceiling Fan@kitchen*close To Schools & Parks MLS#2082493. Keller Williams Realty SW.
Like A New Property; New Tile And Carpet; ALL NEW KITCHEN including Cabinets; Stainless Upgraded Samsung Package; Sink and Faucet; Beautiful Upgraded Granite Slab; 1 Car Garage Attached; New Toilets; New Lighting And Plumbing Fixtures; RUN to see it!! ! MLS#2082478. BluePrint Realty LLC. Iron security doors on all entrances included. MLS#2070522. Coldwell Banker Premier. Entertainers backyard with Custom Pool/Spa and Lounging Area. MLS#2064591. Pulse Realty Group LLC.